HEIGHT DIFFERENCE: The long and short of it. 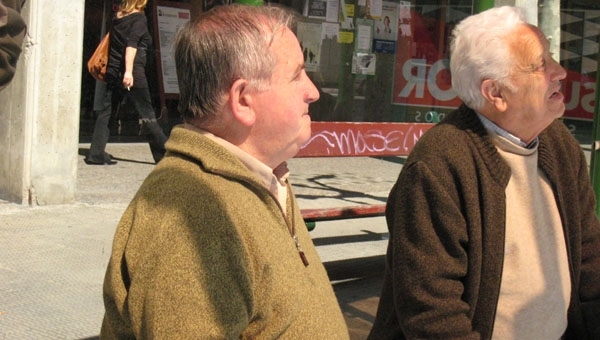 IN nearly every plaza in Spain, you are likely to see older men gathered together fraternally. Well dressed with caps and canes, they sit in casual conversation and watch the world go by. I am of average height (177cm. or 5’ 10”) but the height differences between myself and them are marked. Yet in social situations with younger Spaniards, I notice no glaring differences in stature. What is going on here? Are there significant height differences between the generations within Spain? If so, why? All European nations suffered deprivations after World War II. Unlike the axis countries of Germany and Italy, Spain was denied the massive aid from the Marshall Plan. Furthermore, in 1946 the United Nations initiated a trade boycott of Spain as retribution for supporting the dictator Franco. Additionally, there were the immense deprivations brought about by the Spanish Civil War (1936-9). Conditions were so devastating that the 1930-1940’s have become known as the años de hambre or years of hunger. It is said that cats and dogs disappeared either by starving or having been eaten. Peasants lived on boiled grass and weeds. In the countryside drought and famine were persistent facts of life. Agricultural output had fallen to historicaly low levels while infant mortality due to malnutrition peaked. Spain was on the verge of a full-scale famine. Los años de hambre not onlystalled Spain’s modernisation but also affected the way Spaniards looked. Their carbohydrate diet of primarily bread, rice and grains produced a generation of citizens who tended to be short, or to be more precise, stunted. Between 1961 and 1973 the situation began to change. The performance of the economy improved dramatically. This period by contrast has become known as the años de desarrollo or years of development. Economic growth rates exceeded 7 per cent a year, faster than any country except Japan. Workers’ annual income quadrupled, agriculture was thriving and Spain’s economic miracle led to an epic improvement in the standard of living. Spain’s diet changed. Carbohydrates were replaced by more meat, eggs and the fish, legumes and fruits of the modern Mediterranean diet. Dairy, specifically milk and cheese, intake rose exponentially. These proteins have been shown to stimulate the naturally occurring human growth hormones. By 1975, the height of the average Spanish adult male had increased an amazing 6 cm. for men, 5.1 cm. for women and 3.06 for pre-school children since the años de hambre. The journal Scientific American recently noted that in Spanish families there are three distinct types; Grandparents born in the 1930 & 40’s are likely to be much shorter than those born in the 1950-60’s. These Spaniards tend to grow taller and leaner. Scientific American adds a word of caution. It notes that since the 1990’s, children are likely to become the fattest of a traditionally lean people. Juvenile obesity has spread like an epidemic until now 20 per cent of Spanish children are overweight. Next articleThe benefit queens of central London making me so angry!